Title: 01/22/1990 - Hazard Communication Standard. This is in response to your letter of December 5, 1989 addressed to Alan C. McMillan, Deputy Assistant Secretary, regarding the Occupational Safety and Health Administration's (OSHA) Hazard Communication Standard (HCS) requirements. As was noted in our previous letter, the HCS requires material safety data sheets (MSDS) to be provided prior to or at the time of the first shipment of a hazardous chemical. Therefore the MSDS, which provides information to both employers and exposed employees about the hazards of the chemical and associated protective measures will be at the workplace prior to employee exposures. The questions you raise regarding employee access to the MSDSs and training are addressed in the current HCS. The rule requires employers to maintain current MSDSs, and to ensure that the MSDSs are readily accessible to employees when they are in their work areas during their workshifts. Employees must be informed regarding where the MSDSs are kept, and how they can obtain access to them. When a MSDS is updated with new information, the rule requires the manufacturer to send the updated MSDS to the employer with the first shipment after the update. If the MSDS update involves a formulation change in the product, the label information must also change. 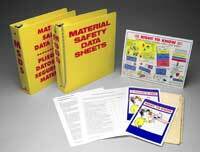 This allows the user to cross-reference the applicable label information with the current MSDS for the product. Chemical manufacturers, importers and employers are subject to citation if they don't follow these requirements. Therefore, for example, if MSDSs are inaccessible because a door is locked, the employer has not provided ready access in accordance with the standard. In regard to the issue of training, OSHA does not expect that every worker will be able to recite all of the information about each chemical in the workplace. The labels serve as an immediate reminder of the hazard information, while MSDSs are a more detailed reference source. In general, the training is to ensure that employees are aware they are exposed to hazardous chemicals, and that they know how to obtain, read, and use the written information on labels and MSDSs As a consequence of learning this information, employees should be following the appropriate protective and emergency measures which have been established by the employer to reduce the risks posed by exposure to the chemical hazards. In the unfortunate event of an injury or illness on the job, it is still the responsibility of the employer to provide appropriate first aid and medical services for the employee. We hope this information is helpful in clarifying current OSHA requirements. The Agency is familiar with your submission of testimony to the record during the public hearings held in December of 1988, and will continue to consider your suggestion as the Agency evaluates all the data and evidence submitted during this rulemaking.